Confession: there were a few moments on Monday during the men’s Olympic downhill that I was hoping the guys would ski a bit slower. Seriously, I can’t type that fast. I spent Monday trying to put all their efforts on the line, madly typing a live play-by-play for NBCOlympics.com, as some redress to the network’s decision not to broadcast the alpine skiing events live. With racers taking the 3km + course in less than 2 minutes, there wasn’t a lot of time for philosophising, but it was certainly a rush, as was checking in with US alpine skiing badboy, bronze medallist Bode Miller in the mixed zone after the race for this final post for the day. 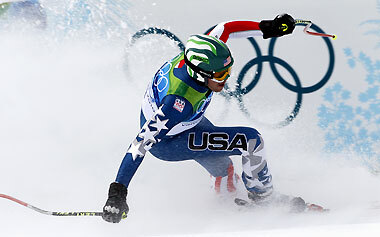 At this, the official kick-off of his third Winter Olympic Games, Bode Miller, admitted that he was relieved to have the first race out of the way. “It takes you out of your element,” says Miller, of the Olympics, acknowledging that he is more in his element on the World Cup circuit and the energy and electricty at the Olympics, and the delays, conspired to create a little nervous energy for him this morning. “I was pretty nervous all morning,” he said. “I really wanted this race to happen. But being nervous and excited is what the Olympics is all about. As soon as I got out of the gate, I felt ready to go.” There’s not a lot of margin for error in downhill, said Miller, whose clean and controlled run gave him the edge over skiers like Canada’s Robbie Dixon, who posted a faster time in training, but who despite his familiarity with the Dave Murray Downhill, did not get any indulgences today. Miller gave a nod to the energy of the crowd. “Apart from being in the U.S., I don’t think there could be a better place to have an Olympics.” Miller will be back fighting for the podium tomorrow for the men’s super combined. Today’s silver medallist, Norway’s Aksel Lund Svindal, will be lining up to, with his eye on five podiums.